This year is the 400th anniversary of the first treaty between Europeans and the First Nations of North America, in 1613. The treaty was between the Haudenosaunee, often referred to as the League of the Iroquois, First Nations who live in the Finger Lakes region of New York State, and the Dutch. They agreed to travel the River of Life side by side and in peace and mutual respect for each other's traditions. The treaty was embodied in a special Two-Row Wampum (see the picture to the left), a belt of beadwork that recorded the terms of the agreement. The two dark rows of beadwork represent the parallel paths of the two peoples, the white background, the River of Life, and tied together by the Covenant Chains of peace—three links: peace, friendship, and as long as the grass is green. To mark this 400th anniversary, the Haudenosaunee have created the Two-Row Wampum Renewal Campaign. This renewal campaign includes a symbolic reenactment in which some 200 paddlers, made up of Haudenosaunee and their allies, paddled down the Hudson from Troy, New York, beginning on July 28, and arrived in New York City on August 9, a total of 140 miles. The flotilla landed at Pier 96 at 57th Street, where some ceremonial events took place. These included gift presentations to the NY Congressman from Syracuse, [ ], and the Dutch Consul General Rob de Vos. They also were joined by the horse-mounted Dakota Unity Riders, originally an independent initiatve of Dakota from Manitoba, Canada, who joined up with the Two Row Renewal Campaign. After the ceremonies at the pier and some food, the assembly walked across Manhattan to the United Nations headquarters building, where they were met by representatives of the UN Permanent Forum on Indigenous Issues. The purpose of the Campaign, according to Andy Mager, its principal organizer, "is about justice. It’s about marking this 400th anniversary of the treaty that Oren talked about and calling on our people, on the people of the United States, the people of New York state, the non-native people of the world, to look at how we’ve behaved, how we haven’t honor this treaty. . . . [I]t’s a call to us to look backwards, but to look backwards to look forward, to see how do we work together to re-establish peace and social justice, and in doing so, to preserve the environment. As Oren mentioned so eloquently, we’re in deep ecological crisis, and if we don’t shift our ways, the future for all of us looks very bleak." Note: The following information is probably incomplete. If you have more information about Friends' participation in the Two Row Wampum campaign, please contact Steven Davison. Thanks. Brooklyn Friends School and Brooklyn Monthly Meeting were both sponsors of the Campaign, as was the Indian Affairs Committee of NYYM. 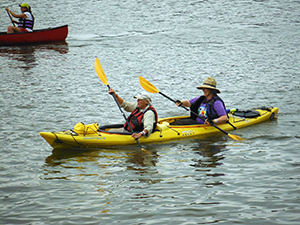 A number of Quakers were among the Allies paddling for all or part of this journey. Liseli Haines and Buffy Curtis paddled the entire distance. Vonn New, Rachel Ruth, Paul Grogen, Alice McMechem, Tom and Sarah [?] from Cornwall Meeting, and Tom Rothschild, all paddled for sections upriver on the Hudson. Our apologies to Friends we don't know about—several Friends reported sometimes comical encounters with people whom they didn't know but turned out to be Quakers taking part in one way or another. Many Friends also provided ground support along the route, including Susan Wolf, her daughter Melissa Wolf, and Susan's granddaughter Naia L'Amour-Wolf (Melissa and Naia came from El Cerrito, California, to participate), Rachel Ruth, Paul Grogen, Sybil Perry, Janet Carter, Tom Rothschild, Lynne James, Anne Wright and Bob Lohaus. These Friends provided massages, food, coordination, housing, and other services to the paddlers along their route. Brooklyn Meeting provided hospitality to 50 people and held a potluck dinner at the Meetinghouse on Friday, August 9. Lots of Friends from around New York Quarter were involved in that effort. You can view a slide show of our photographs of the Two Row Wampum event on Photobucket by clicking on the following; Two Row Wampum Renewal Campaign. You can view our video of the arrival procession here: Two Row Wampum video. Coverage by Democracy Now!, including interviews by Amy Goodman with Onondaga Leader Oren Lyons and Pete Seeger. A message from the organizers of the Two Row Wampum Renewal Campaign. On the Two Row Wampum Renewal Campaign—has details on the canoe trip, background on the campaign, including its goals, news clipping, a photo album and videos. Background information on the Haudenosaunee.